Tennis: Stefanos Tsitsipas and Bernard Tomic advance at the Libema Open in Den Bosch, and Nick Kyrgios and Roger Federer edged closer to a possible semifinal meeting at the Mercedes Open in Stuttgart. Nineteen-year-old Stefanos Tsitsipas overcame stiff resistance from Malik Jaziri of Tunisia to win 4-6, 7-6 (8), 6-2 in the pre-quarters at the Libema Open in Den Bosch. Stefanos is scheduled to meet Richard Gasquet in the quarterfinals, and the winner will meet either Bernard Tomic or Fernando Verdasco in the semis. Stefanos Tsitsipas will play his first quarterfinals on the grass at the Libema Open. Tsitsipas enjoys a 1-0 record against Gasquet. He beat Richard Gasquet in straight sets on the hard courts in Doha earlier this year. Stefano Tsitsipas is the real deal, and his single-handed backhand is more consistent and, perhaps, more powerful than Roger Federer’s and, we believe, will develop into a lethal weapon, with Federer like variation and guile, over time. He is fast-footed and carries a natural power to his ground-shots. We believe that Tsitsipas is at par with Dennis Shapovalov in the talent category, and between Dennis and Stefanos, tennis is in good hands for another decade or so. 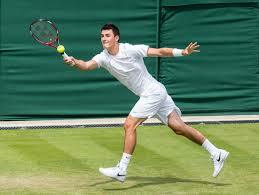 The resurrection of Bernard Tomic. Bernard Tomic is resurrected this week and will now be facing Fernando Verdasco who he has beaten five times in as many meetings. There is a good enough chance of him making the semi-final, where he could face either Gasquet or Tsitsipas. The top half of the draw, in Den Bosch, is wide open now. The top seed Mannarino was taken out by Jeremy Chardy in straight sets today and last year’s winner Gilles Muller lost his very first match to Ebden earlier this week. The top half of the draw in Den Bosch, therefore, is open for just about any of the remaining contenders to make the finals. Prajnesh Gunneswaran took out Shapovalov for Roger Federer. Elsewhere at the Mercedes Cup in Stuttgart, Guida Pella took care of, the Shapovalov dispatcher, Prajnesh Gunneswaran, and earned himself a meeting with Roger Federer. Guido Pella extended Roger into two tie-breaks at the 2016 Wimbledon and is a tough customer on grass. Roger Federer should, however, be able to win the match in either two or three sets. Nick Kyrgios will meet Feliciano Lopez in the quarterfinals of the Stuttgart Open. Nick Kyrgios edged closer to a date with Roger Federer by beating Marterer in three, and will now face Feliciano Lopez in the quarterfinals of the Mercedes Cup in Stuttgart. Lopez, on the other hand, dispatched Gilles Simon in straight to enter the quarters. Lopez enjoys a 2-1 record against Kyrgios, but that one loss to Nick has been on the hallowed grass of Wimbledon in 2016. This match could go either way and is not an easy one to call. 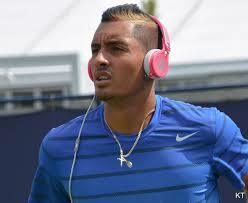 Nick Kyrgios – Can he be number one? Milos Raonic meets Tomasz Berdych in the quarters at Stuttgart. The winner between Nick Kyrgios and Feliciano Lopez will meet either Tomasz Berdych or Milos Raonic in the semifinals on Saturday. Milos Raonic enjoys a 5-3 head-to-head with Berdych, but the two have never played on the grass, so this would be an interesting one to watch. We, however, give a slight advantage to Milos Raonic in Stuttgart. ← Tennis: Roger Federer survived in three, Prajnesh Gunneswaran ousted Shapovalov, and Bernard Tomic, the enfant terrible of tennis, swung back to life.